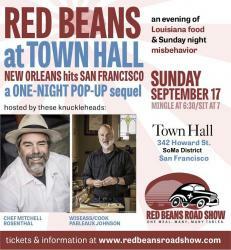 The Red Beans Road Show comes to SAN FRANCISCO for a Sunday-night supper at Town Hall. Featuring starters and mystery sweet from Chef Mitch Rosenthal. It’s gonna be a good time, yo. Join Us! 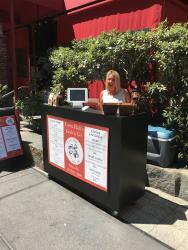 August 18th at 6:30 as we welcome the team from Brown Estate in Napa Valley. Brown Estate is truly a family affair. The property was purchased by their parents in 1980 and planted to vinifera grapes. In 1995, the ‘kids:’ Coral, Deneen and David, got the notion to make their own wine. 2016 marked their 20th vintage! Today, they make gorgeous, layered and complex wine that show the superiority of Napa Valley with the elegant hand of restraint. Join us! August 11th at 6:30 to enjoy a selection of Chef’s Country Hams paired with four expressions of Knob Creek Bourbon, Rye, Smoked Maple and Single Barrel Whiskies. Guests will be greeted with a welcome cocktail followed by pairings led by the Knob Creek West Coast American Whisky Ambassador. Why Knob Creek.............? Crafting a bigger, fuller experience: Knob Creek is a bourbon crafted from passion. From patiently aging the whiskey to achieve its signature full flavor to selecting the best barrels in the rickhouse, every detail is carefully considered to ensure the bourbon going into the bottle is as big as and flavorful as Booker Noe meant it to be. 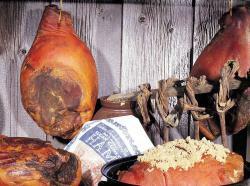 Why Ham.............? Town Hall focuses on commitment to quality, artisanal farmers. We are sourcing the hams from the top farms in Tennessee, Kentucky and North Carolina. They are each aged for upwards of 18 months. Barrel and Fare brings the two worlds together by focusing on similarities in process and craft, we highlight the shared values, flavors and techniques that make Knob Creek and ham pairing a perfect match. 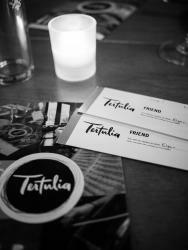 Tertulia is a chamber music series that is designed to attract new and experienced audiences alike, or really, anyone who loves incredible food and music. Tertulia presents world-class chamber music concerts in restaurants around the city, with three performances separated by extended intermissions. The format and program is designed to enhance the social and culinary experience, but at all Tertulias, the music is paramount. See you soon at Town Hall.